One of the biggest challenges for me in printmaking is getting the block and the paper to line up the same way each time. Printmakers call it registration. Even 1/16th of an inch off can make the print look blurry and the edges show the raw colors I have been using rather than the gentle color blends. This entry was posted in Registration, Techniques and tagged Linocut, linoleum reduction print, Picasso, relief printmaking, template jig on August 22, 2011 by Elizabeth Busey. August is a very hot month in the Midwest, and in past years has been very dry. This year is no exception. My exhibit at the City Hall Atrium in Bloomington, Indiana, is designed to quench the viewer’s thirst. Entitled “Force of Nature…Wellspring of Life,” the show has fourteen of my prints that have something to do with water. Some celebrate the beautiful calming aspects of water, while others consider its carving, sculpting force. Still others show how our agricultural practices are shaped by water’s availability or scarcity. My latest print, Day’s End on the Ontario Shield, highlights the intricate patterns created by the freezing and thawing of glacial waters over the millenium. Elizabeth Busey, Day’s End on the Ontario Shield, Linoleum Reduction Print, 2011. This entry was posted in Exhibits, Topography and tagged Bloomington Indiana, City Hall, glaciers, IN, Linocut, linoleum, linoleum reduction print, ontario shield, relief printmaking, Showers Building, sunset, topography, water on August 7, 2011 by Elizabeth Busey. I love topography. I spend more time than I’d like to admit on Google Earth, gazing down at the patterns of the earth. Many of these patterns are created by water, and so all of my topography prints have some reference to water. I also live in the Midwest — specifically the Ohio River valley. We have had record rain this year, but each spring brings back the reminder that we live in a watershed. It has been heartbreaking to listen to the news coverage of the river flooding that is occurring along the Ohio and Mississippi rivers. Rivers are a vital part of our landscape, providing transportation, fertile fields and recreation. We are not, however, the master of water. The levees and flood walls we build don’t just make the water go away, they push the water somewhere else. To someone else. Elizabeth Busey, Remembering and Forgetting. Linoleum Reduction Print, 2010. 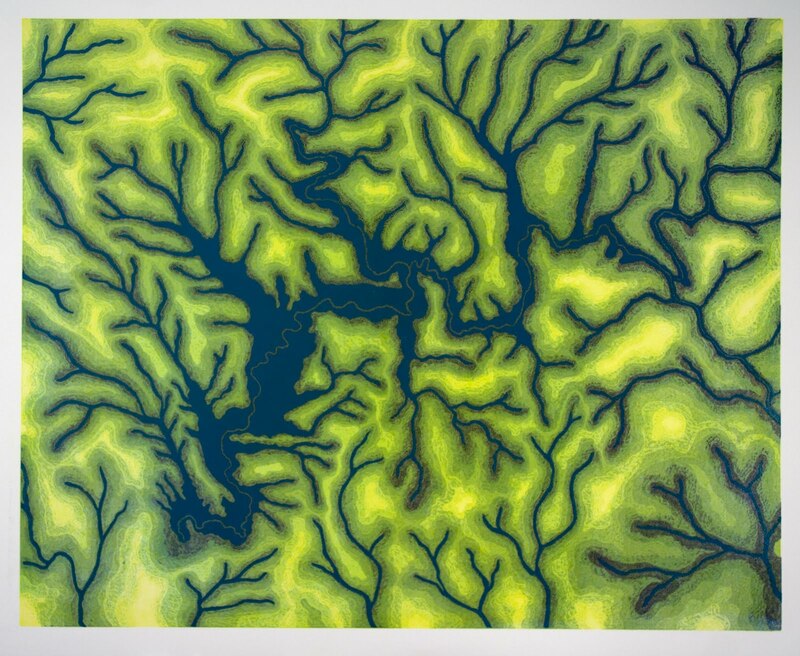 This entry was posted in Topography, Uncategorized and tagged floods, Linocut, linoleum reduction print, relief printmaking, topography, water on May 19, 2011 by Elizabeth Busey.